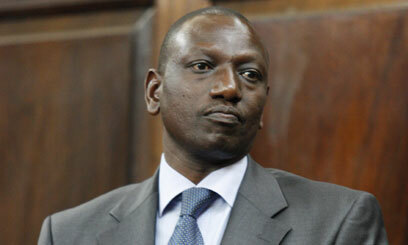 The Hague, Netherlands: The tenth prosecution witness at the International Criminal Court (ICC) sensationally claimed Deputy President William Ruto publicly uttered statements that helped fan violence after the 2007 elections. Witness 128 told the court that Ruto attended a rally at Kobujoi, in Rift Valley where he allegedly told members of the Kalenjin community to massively vote for ODM so that they can get chance to reclaim their ‘dispossessed’ land. “I told you that Ruto asked the Kalenjins to vote in massive numbers and that once ODM takes power, it was going to uproot tree stumps,” the witness told the court “What did you understanding by the term uprooting tree stumps?” posed prosecution counsel Regina Weiss. “At the beginning, I didn’t know what that meant but after the violence, we came to learn that he was talking about non-Kalenjins,” he added. “What were they talking about?” Weiss asked. Former GSU commander Samson Cheramboss, said the witness, prepared the venue of the meeting at Kobujoi. Cheramboss, the witness told the court, was a close ally of the Deputy President to the extent that he spoke on behalf of Ruto in a rally held at Koyo, which was allegedly also attended by former Cabinet Secretary Sally Kosgei. “Who were the speakers at the Koyo rally?” asked Weiss. “They were Samson Cheramboss, Sally Kosgei and their friends were also there but I don’t remember their names,” said the witness. “He talked about two tribes, the first was Luhyas and the second was Kikuyus. He said if ODM won elections, then Kalenjins would be free to do what they want and would take back land bought by Luhya,” said the witness. The witness at the same time narrated how the head of police at Nandi Hills was murdered in cold blood as he attempted to speak to a group that was allegedly organised to cause havoc. He said that after elections results were announced in favour of former President Mwai Kibaki, tension was high in Rift Valley. That some young men organised themselves into a militia group and went to Nandi Hills, where the said officer was murdered. “There were rumours going around in different places and they reached us. People coming from Eldoret told us violence had broken out in the town,” said the witness. Other tribes He added persons only identified as 4 and 5 organised young men ostensibly to go to the DC’s office at Nandi Hills. According to the witness, women were strategically positioned at various points on the way to Nandi Hills and each of them had food for the men to eat. The witness went on to describe the situation at Nandi Hills where the police officer was killed. “When we reached Nandi Hills town, there was a huge crowd; I thought we would go to the DC’s office but we didn’t get that far. The Nandi Hills police boss came to address us, but before he spoke, someone shot him with an arrow. He killed the head of police, and behind me there people going into the shops. There were few Kalenjin policemen, who showed them the stores owned by Kikuyus where people started looting. Kalenjin police officers helped the public to break into the shops. My friend telephoned me that a petrol station had been blown up,” he said.